A glazed roof is an excellent way of bringing natural light into your home, whether as part of a new extension or home renovation. There are a number of roof styles, types and materials available for glazed roofs such as skylights or lantern roofs. In this article, we give you some information on what you need to know about aluminium lantern roofs. What are aluminium lantern roofs? Lantern roofs differ from flat rooflights or conservatory roofs in that they are triangular in design. The main benefit of lantern roofs is their design suits old or new houses thanks to how they are crafted either with a modern square or traditional looking roof bars on the inside and cappings on the outside. Lantern roofs are typically used in flat roof constructions and provide a three-dimensional appearance thanks to their pyramid or triangular design. Where can you fit a lantern roof? Lantern Roofs can be fitted to any flat roof or as part of a new extension. What you also have the choice of is matching fixed window frames underneath the roof lantern, or directly onto the roof kerb and cill. A new rear extension featuring bifolding or sliding doors is perfect for a roof lantern as it allows natural light to flood into the home both from the large door glass and the roof above. You can fit a lantern roof to a kitchen extension, in your lounge, above a staircase and even in porch. What lantern roof styles are available? You may already be familiar with the lantern roof as the tradition four-sided rectangular shape. These remain the most popular, but you can also have other styles. Every lantern roof is made to measure and comes in the choice of standard rectangular, octagonal, square, or the more traditional ‘hipped’ style. You can even choose a pyramid design. Will a lantern roof make my home too warm? One of the problems with old conservatories was too hot in the summer and too cold in the winter. The issue of uncomfortable rooms with a glass roof has mostly been eliminated thanks to better design, thermal efficiency and a vastly improved glass specification. Lantern roofs will not make your home too hot or too cold. You can now accessorise and enhance all available lantern roof styles with self-cleaning glass, blinds, manual or automatic roof vents and rain sensing vents as well that open and close as the weather changes. Why aluminium lantern roofs are best. The most popular material for lantern roofs is aluminium, and there are many great reasons why. Aluminium provides a slim and robust roof that is much thinner and has bigger glass panels. Here is how aluminium lantern roofs compare with other materials. Maintenance Virtually maintenance free Virtually maintenance free Some maintenance needed. Design options. Excellent Restricted by size Excellent. Aluminium lantern roofs offer you the best regarding all round value, performance, sight lines and colour choices. PVCu lanterns rely on heavy internal reinforcement because of the weaker plastic profile meaning a thicker looking roof with size limitations. Timber roofs are excellent for the natural look and warm feel, but you will pay more and have to take care of the roof over the coming years. Aluminium gives you the best in slim, sleek and contemporary lines. Aluminium lantern roofs will also give you the best in colour choice with over 200 different colours available, the choice of a different colour inside and out as well as optional metallic effect finish as well. At Northwest Bifolds we offer the market leading Atlas lantern roof. This minimalist, slim roof is based on the design used in high rise facade glazing you see in tall buildings and large span atrium roofs. By far, the most popular roof on the market at a fantastic price, Atlas lantern roofs are 30% narrower than other aluminium lantern roofs and with a central ridge that’s up to 70% narrower. Best of all Atlas lantern roofs do not rely on any internal tie bars and supports, ridge covers or other bulky reinforcement. For you, this means minimal aluminium, maximum glass, and more natural light. Subject to sizes, you can even choose a lantern roof with the bare minimum of roof bars, giving you a near frameless appearance. How are lantern roofs decorated on the outside? You can customise the outside of your lantern roof with plain or decorative roof bars. The plain roof bars give a more contemporary appearance to your lantern roof, providing a matching appearance to a modern bifolding or sliding door. If you want a more traditional appearance, decorative roof bars complete with cresting and finials are available. How much does a lantern roof cost? 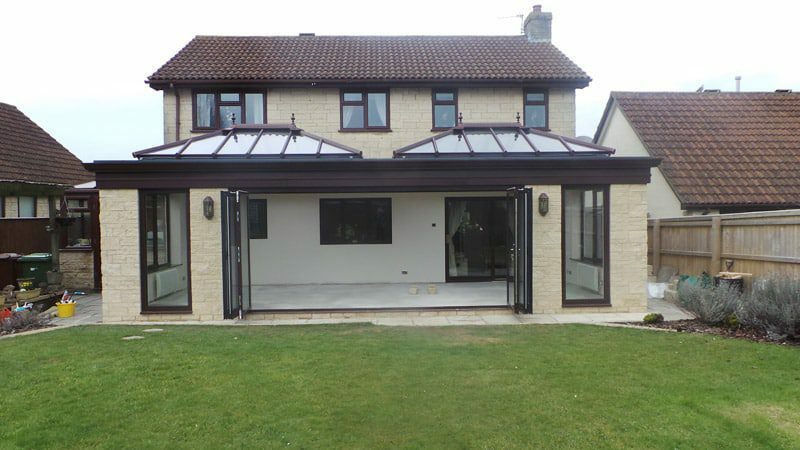 At Northwest Bifolds we expertly install quality and affordable aluminium lantern roofs. We buy directly from the roof designers meaning our prices are kept low, without the associated ‘middle man’ markup you may find with other companies. Contact us today for a free, no-0bligation quotation. We can even quote you for skylights, walk-on glass, rooflights and even a new conservatory.